World's Biggest Anaconda Found In The Philippines? A photo that claims to show the world's biggest anaconda snake that was purportedly caught in the Philippines has been circulating on Facebook recently. 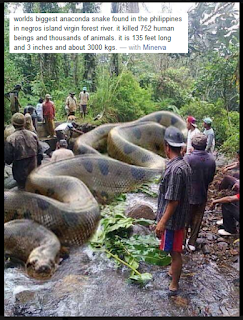 Its caption reads, "World's biggest anaconda snake found in the Philippines in Negros Island virgin forest river. It killed 752 human beings and thousands of animals. It is 135 feet and 3 inches long and about 3000 kilograms." 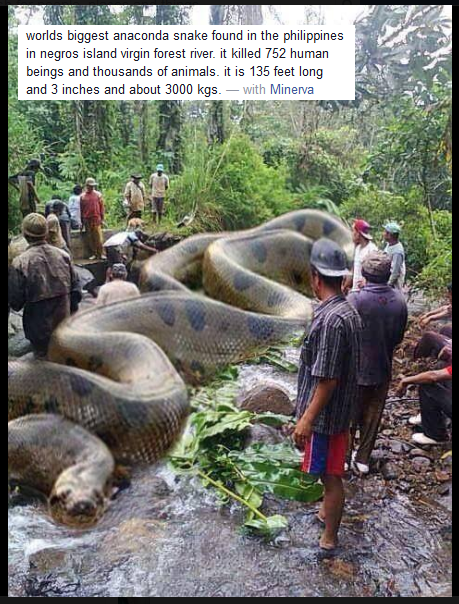 We believe the photo is fake and there is no truth about the claim since there is no anaconda in Philippine forests and rivers because the snake is endemic in South America. Additionally, if you take a closer look of the image, you can immediately tell that it was edited, and poorly edited at that. It has not been reported by news agencies as well. We were curious where it was taken so we searched for the original photo in the interwebs and we found this. It looks like the person who edited the picture just mirrored the said photographed of an anaconda and attached it on the photo of the group of men. As we always say here on Noypi Stuff, don't immediately believe what you see or read online and make sure that you check reliable sources before sharing them on your social media accounts.